Artist profiles, gallery news and community events coming to you from the MREAM crew! Over the past month MREAM Gallery has played host to not one ...but TWO exhibitions! The FEMS crew put on a grand opening for the launch of their FEMS Zine. The accompanying exhibition included works by several artists whose work featured in the first edition of the zine and it was fantastic to see so many new young faces in the space. 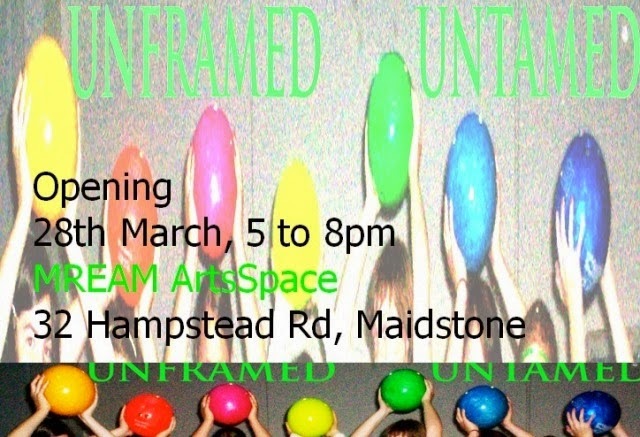 To conclude the month of March "Unframed Untamed" took place in the MREAM gallery. The show featured a collection of unframed works by members of MREAM - spanning sculpture, installation, textile art, oil and watercolour painting, printmaking, photo collage and drawing. Several artworks were sold on the evening and a generous spread was devoured by those in attendance at the opening. Congratulations and many thanks are owed to Vonne for her efforts in co-ordinating both shows in the MREAM Gallery. Much gratitude is also owed to Vonne's team of helpers! Our gallery is very competitively priced and we do not charge commission! This weekend MREAM Studios & Gallery will play host to its first ever zine launch! 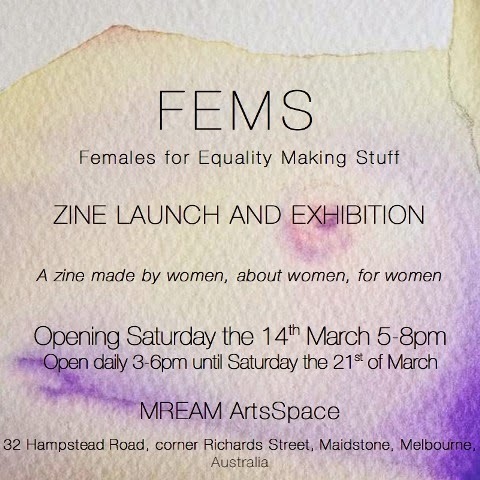 Organised by MREAM Artist, Vonne Beyer, the "FEMS" zine launch and exhibition will open this Saturday evening at 5.00pm at MREAM Studios & Gallery, 32 Hampstead Road, Maidstone VIC 3012. Thereafter, the exhibition will run for one week (3-6pm daily) until Saturday 21st March. "FEMS" stands for Females for Equality Making Stuff and is a zine made by women, about women and for women. All are invited to attend the opening! For the uneducated, "zine" is a term used to describe an independent (maga)zine or publication with a much smaller print run and alternative content including stories, poems, articles, artwork and photography. Zines are a refreshing change from mainstream print media! MREAMers are firing up for their first group show of 2015! Everyone is welcome to attend our opening. Many works within the exhibition will be available for sale. Whilst many of you were still recovering from the shock of landing in the year 2015, January saw the MREAM crew rally together and run a fundraiser BBQ at Masters Braybrook store. Although a rather overcast Sunday presented some challenges, the delicious aroma of sizzling snags and Klaus’ thinly sliced onions© soon lured some hungry customers. Thanks to all who came along and either helped out on the BBQ roster, made a purchase or donation and had a chat. Keep your eyes peeled for more MREAM fundraising events. Maribyrnong Rivers Edge Arts Movement was established in 1988. We are a collective of artists, writers and musicians living, working and exhibiting throughout Melbourne's western suburbs. MREAM have recently built a new home in Maidstone where we occupy and lease studio spaces, run community arts/craft workshops and coordinate our brand new public art gallery!